Does the Internet empower communities or perpetuate the status quo? Can universal Internet access resolve education, employment, and other social gaps? Report on authors' longitudinal assessment of low-income community access to free Internet in New Zealand, in terms of new Internet users' (1) community belonging, (2) Internet connectedness, and (3) civic engagement. Findings show Internet connectedness may have only a minimal impact on community capacity due to constraints such as family transience, difficult domestic circumstances, inadequate project resourcing, and poor literacy. Internet ubiquity may not be a strategically useful social objective unless contextual limitations are recognised and addressed. A discussion of the concept of "virtual community" as a part of a broader discussion of the notion of "community" in the electronic age. An examination of the concepts and role of Community Networks and Community Networking in the context of public policy. This report outlines an approach to evaluation based on the work of K-Net Services, an organization in North Western Ontario that promotes and supports broadband networking in First Nations communities, reported on initially in the premiere issue of JoCI. This pilot study examines how homeless people in central Scotland integrate and appropriate mobile phones and the Internet into their everyday lives, and the various meanings these information and communication technologies (ICTs) come to hold. It is found that "digital inclusion" does not necessarily lead to "social inclusion" into mainstream society, since homeless individuals tend to use ICTs in ways which reinforce the patterns and practices of their subculture — there is not a standard way of making use of technologies. Many homeless people thereby remain socially excluded in numerous ways despite their somewhat regular use of ICTs. It emerged from the study's findings that mobile uptake can actually be more "inclusive" than Internet uptake. Based on author's 2003 master's thesis, the work was carried out as an internship at the NGO Funredes in the Dominican Republic, as a part of its Olistica project, an Internet-based research observatory devoted to the assessment of the social impact of ICT in Latin America and the Caribbean. The thesis aimed to contribute to a framework for the assessment of ICT-for-Development projects from a critical, social viewpoint. It consisted partly in an extended theoretical discussion on the social dimensions of technology, and partly in a case study of the Lincos project in the Dominican Republic. Upon request of the editor, the focus of the article is directed at the observations of the field study, after a brief introduction to the theoretical presumptions and concepts of the original thesis. Community informatics projects are instituted to achieve global equity in the distribution of ICTs and attendant socio-economic benefits. Technology disciplines and financial disciplines, specifically management and cost accounting, have no history of goal congruence, and many ICT-based community informatics projects fail because of a lack of knowledge and insight about their life-cycle costs. This paper introduces a model for systematic measurement and benchmarking of the life-cycle costs of community informatics projects, and invites debate about its bona fides, so that it can be refined and applied to the benefit of needing communities in the Developing World. This paper proposes a sociological model for understanding the social appropriation of information and communications technology (ICT). It argues that the relationship between a media form and the society in which it is deployed is of key import in understanding how a media is used. An account is given of the way in which the power of ICT to affect society has been understood. It is argued that positions within this debate are deeply tied to Western cultural beliefs and values. An alternate model of technology and ICT is proposed. In this model ICT is regarded as "modal" in operation; it may operate differently in different situations. 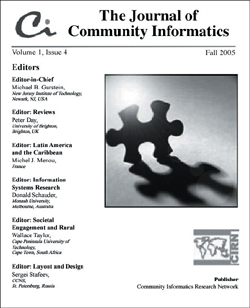 Visit the Journal of Community Informatics website: CI-Journal.net. Michael Gurstein is the Editor-in-Chief of the Journal of Community Informatics.